Its gay abundance on the south-east slope of the hill should have ensured that Bird’s-foot . 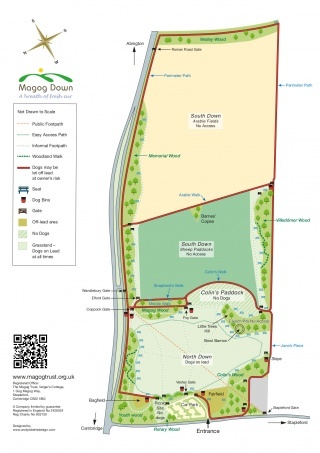 Trefoil was noticed by most visitors to Magog Down this summer. A member of the Pea family (Papilionaceae) it shares that group’s distinct arrangement of petals; a broad, erect ‘standard’, two narrower ‘wings’ at the sides, and two lower petals conjoined to form a 'keel' which conceals the stamens and styles. 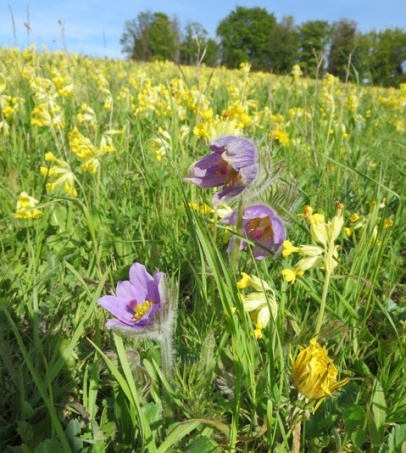 The flowers, which may be found from June to September, are yellow, often streaked or tipped with orange or red, which gives the plant its other common name of ‘eggs and bacon’. To my eye there appears to be more than usually high proportion of pure yellow flowers in the Magog Down population (which experts tell us is of a Central European strain introduced with the seed used to re-create the downland flora). The flowers are borne in clusters of two to eight. After flowering, long (up to 3cm), straight pods develop, each ending in a short ‘claw’ which makes the pod clusters look remarkably like the birds’ feet from which the plant takes its name. ‘Trefoil’ suggests that the plant’s leaves have three leaflets; in fact they have five, but the two lower ones are borne very close to the stem and are of a slightly different shape to the other three. 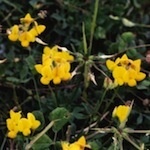 To the best of my knowledge, Bird's-foot Trefoil has no medicinal virtues (nor, indeed, any poisonous properties) nor can I find a reference to any part of it having any culinary use. But though the plant may have been of little practical importance to them, these pretty, slipper-like flowers and remarkable claw-like seed pods certainly appealed to the imaginations of our ancestors. Its over seventy different local English names suggest that it once evoked more than a mere passing interest (less than a dozen local names have been recorded for the equally common and much more conspicuous tufted vetch - (Vicia cracca). 'Grandmother’s slippers' and 'Ladies shoes' are but two of the many names referring to the shape of the flowers. More interesting are those that refer to the seed pods. These range from the divine through the human and animal to the positively diabolical; ‘God Almighty’s Thumb and Finger’ (it is known in France as ‘Pied du bon Dieu’), ‘Ladies Fingers-and-Thumbs’ (possibly a reference, as in so many plant names, to ‘Our Lady’ the mother of Jesus), ‘King’s Fingers’, ‘Grandmother’s Toe-nails’, ‘Dead Man’s Fingers’, ‘Cat’s Claws’, ‘Crow Feet’ (cats and crows have both been associated with the Powers of Darkness), ‘Tom Thumb’s Fingers and Thumbs’ (Tom Thumb was originally a small goblin in English folklore), ‘Devil’s Fingers’, ‘Devil’s Claws’ .... You can read what you will into such a list of names. Some see it as evidence that the plant has been regarded sometimes as good, sometimes as evil - or that it once had such an evil reputation that it was thought necessary to ‘baptise’ it by giving it a Christianised name. For myself, I think it simply reveals our forebears’ whimsical imaginations when it came to naming a well known (if not very useful) little plant which too soon exchanges the delicate golden slippers of its youth for the ugly black claws of its old age.